Review: Imagine being in the middle of a shoot out and being separated from your family. You would probably dread it. Salva could not dread, it was pure reality. Oh how I could just feel the pain and sorrow of Salva. A Long Walk to Water is about how Salva gets separated from his beloved family by countries away. This tragedy is because the Muslims want the people from Sudan to become Muslim. So Salva is on a quest to freedom. Will he survive or not? Salva has to cross unbearable deserts just to get food and water. However, he does have one companion, his uncle. Though he and his uncle were not the only ones struck by the war. Hundreds were affected. Salva felt as if all of the people were coming to join his "group". Now with all the strangers surrounding Salva and his uncle it makes life much harder. Triple the amount of food but wait no water. Crossing lion-infested desserts with no water what so ever was going to be impossible. A couple months later the huge group made it to a refuge camp, but on the way a soldier kills Salva's uncle. Alone, after some years at the camp Salva is forced to leave and go to Kenya. His journey now starts with being in another refugee camp and ends with living in a cozy home in New York. A Long Walk to Water is fantastic but also sorrowful. After reading this book I rate it a four stars out of five. It was extremely suspenseful, like when Salva was getting out of the shootout I thought he was going to get hurt. That just kept me reading. However when the refugee camp got repeated the book got less interesting. In the end, I recommend this book for eight and up because of the killing (it might be inappropriate). I have never read a more interesting book ever! Review written by Zain (6th grade student). We would like to thank Houghton Mifflin Harcourt for providing a copy of A Long Walk to Water for this review. 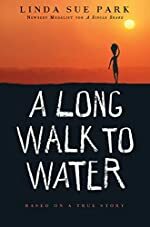 Have you read A Long Walk to Water? How would you rate it?